This Easter was my fifth year shooting Bring Your Own Big Wheel, which is itself in its tenth year, and it was just as raucous, hilarious, and crowded as ever. 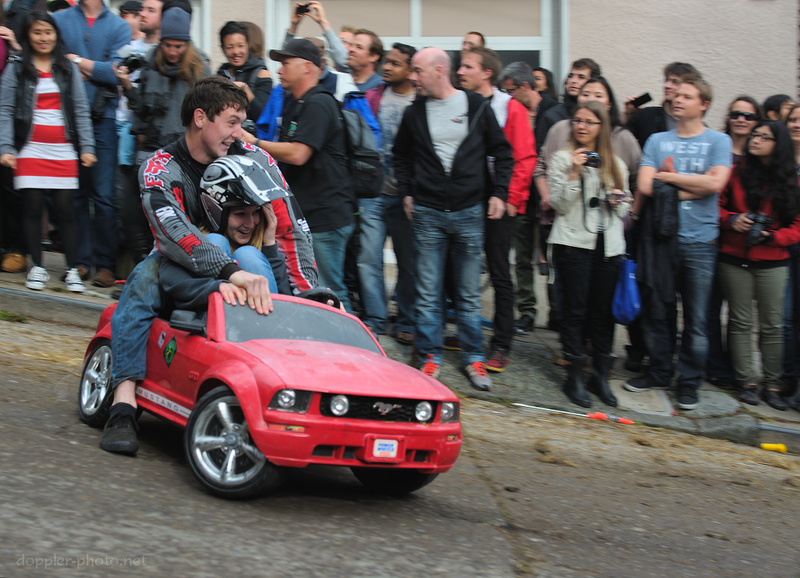 That said, over the years, I feel like I've gotten to know BYOBW a little bit. The first year or two were mostly crazed excitement, but now it's crazed excitement plus maybe a little bit of nuance. That is, once you experience an event enough times, you start to gain some higher-level context that was easy to miss at the outset. You start to learn things about the prior episodes. You spot patterns, and you also begin to notice the event changing over time. And lo, the times are a-changin', although not too much, so far. With each passing Easter Sunday, it feels like the general age range of participants has expanded. BYOBW is growing into an event not only for the crazy among us, but also for the people (and parents) who might not be as adventurous. In the time that I've been watching, couples' vehicles and groups of friends have always been pretty common. More recently, I've also noticed more kids taking part, whether it be on their own, with a parent, or with (presumably) siblings. The participation at the other end of the age spectrum has increased as well. 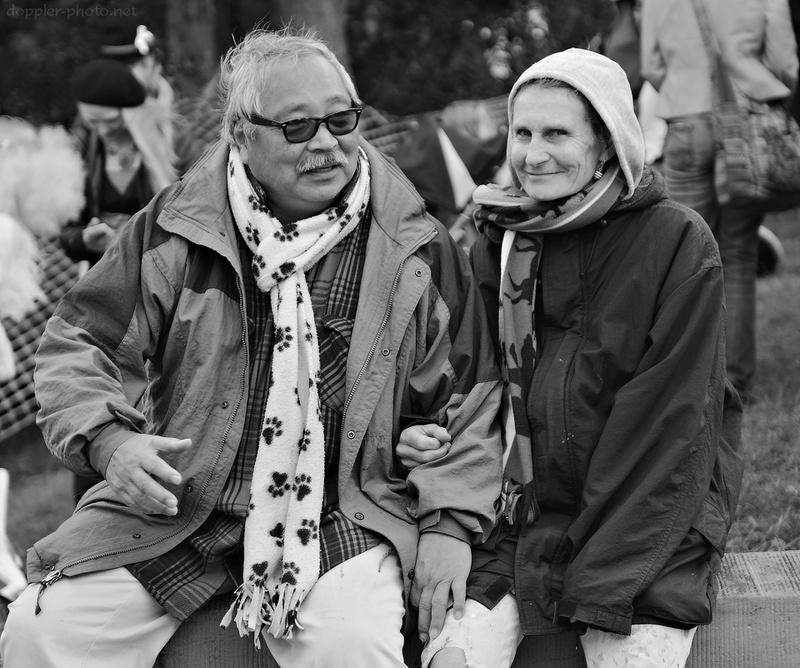 I found these two folks sitting near the start as people were packing up and leaving. The "big wheel runners" have also become more organized and have put more effort into dressing for the part. 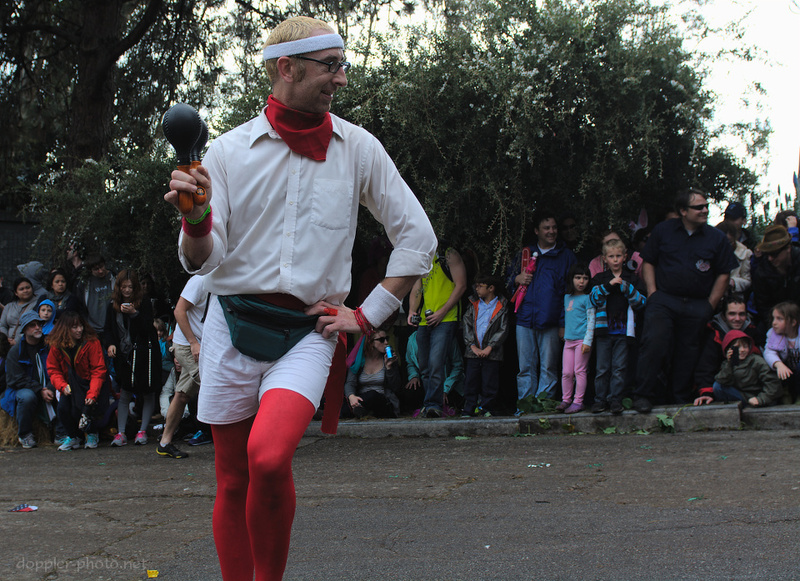 This guy had a variety of props, including the maracas, an American flag and matching umbrella hat, and a slide whistle. Each time I saw him, he seemed to be running a different gag. But as the saying goes, the more things change, the more they stay the same. 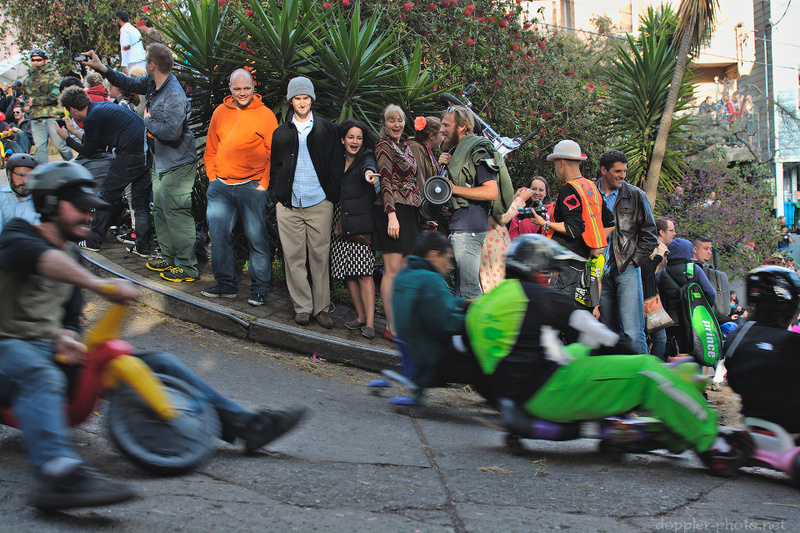 And certainly as BYOBW has evolved, its defining characteristics have only served to become more prominent. For one, it's as thrilling as ever, due in large part to the sheer steepness and twistiness of the course. And the costumes remain outstanding. I got some shots of "Michael Jackson" the last two years, and this year he was back again. For his last run down the hill, he found a tiny Tonka truck with a missing wheel to ride, and he'd grind along for a couple meters, get up and do some dance moves, and then "hop" back on to start the process over again. And it's still volunteer-run and funded by individual donations. 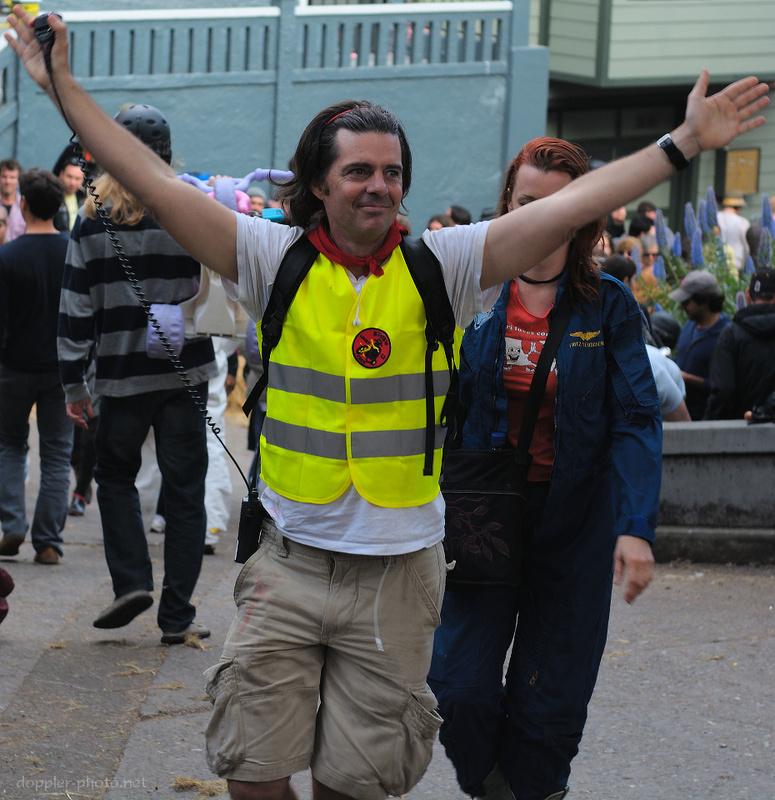 Here, a finish line volunteer salutes the crowd as he walks up the hill at the conclusion of the event. 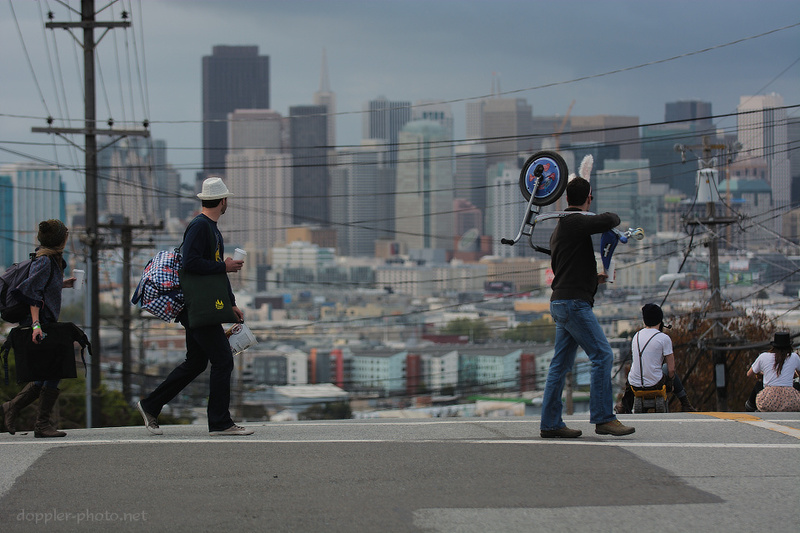 In many ways, Bring Your Own Big Wheel remains a microcosm of San Francisco itself: quirky, adventurous, inclusive. The mere possibility for an event like this to begin, to persist, and to grow and evolve is in itself a reflection of SF culture. But now, the event is bumping into a challenge that has also plagued its parent city: sustainability. 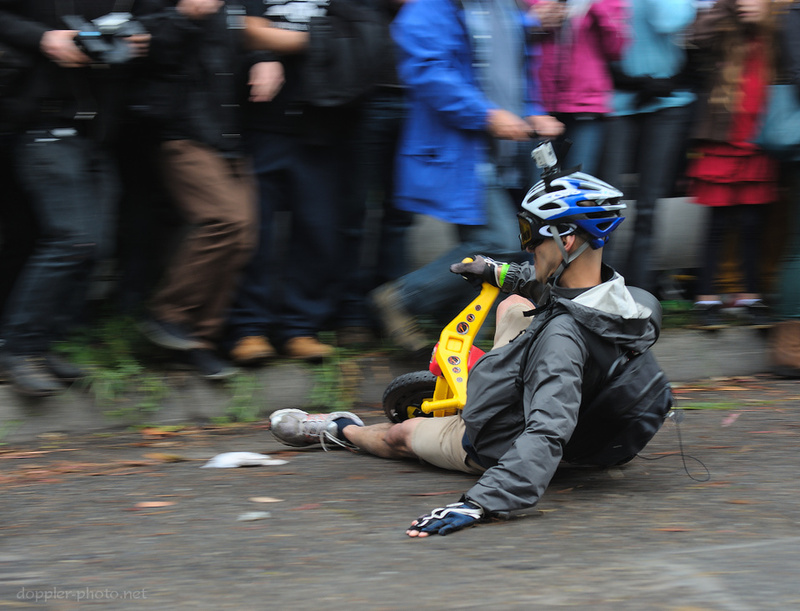 As enthusiasm over the event has flourished, the BYOBW organizers are now fighting to keep the the event from outgrowing its venue. Roads that are steep and twisty are few and far between. This year's run is already in the books, though, and from what I could tell, it was a shining success. 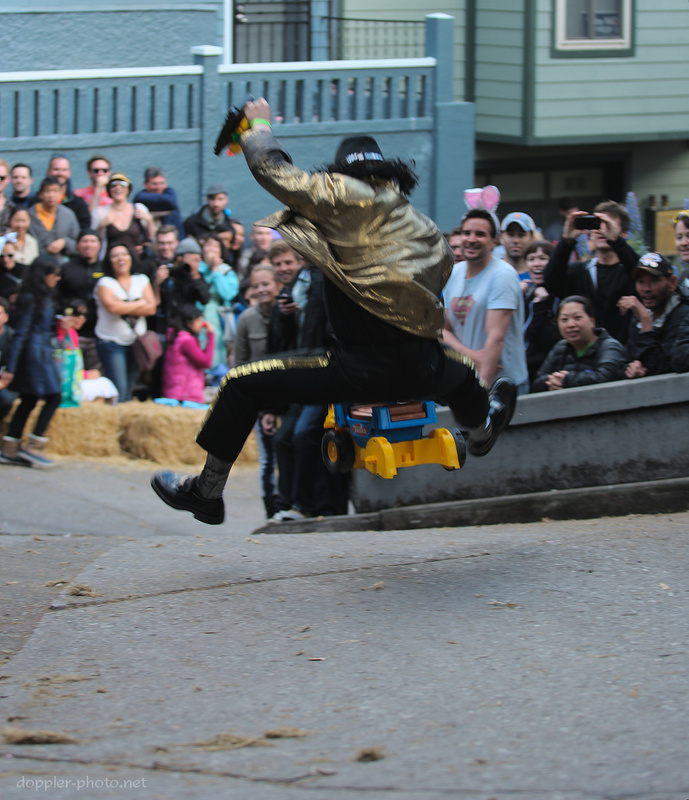 Much like SF before it, BYOBW has managed to roll with the punches while maintaining its own unique culture.